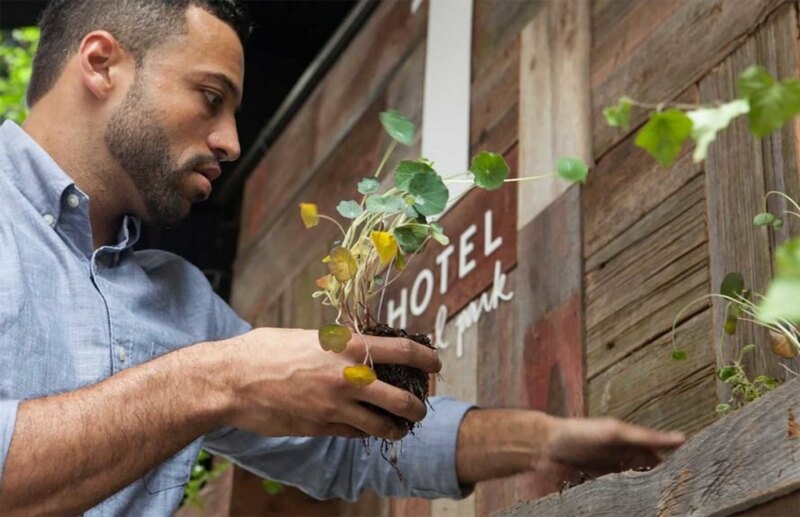 From a massive herb garden wall to organic linens to a lobby farmstand, luxury accommodation brand 1 Hotels will be pulling out all the eco-friendly stops at its new Central Park location, which is set to open in August. After several delays, the flagship hotel for the company, which is an offshoot of Starwood Hotels and Resorts, is expected to launch its sustainable services within a few weeks. The eco-friendly hotel will feature environmentally-conscious touches like Tesla electric car services, reclaimed barn wood wall decor, and even old-fashioned chalkboards next to beds—because notepads are clearly a waste of paper. Inside 1 Hotel Central Park, visitors will find a host of unique, eco-friendly features. According to the hotel’s website, the guest rooms will be adorned with “reclaimed wood, raw materials, painted brick walls and accents of blackened steel and copper.” The rooms and common areas will be awash in neutral tones with soothing textures, thanks to a serene interior design by AvroKo Hospitality. Terrariums and pops of greenery show up in unexpected places, like tucked into the wall and above guest room windows. The botanical features were supplied by NYC’s own Sprout Home. Each room will be furnished with the usual amenities you’ll expect in a luxury hotel, but with an eco-twist. Hairdryers are of the “eco-ionic” variety, and a five-minute sand timer will help you refrain from wasting water with a lengthy shower. 1 Hotels has also provided yoga mats in each of its 230 guest rooms, to secure the decidedly zen-like atmosphere. The hotel was originally scheduled to open last fall, and then in March, and then again in July, so expectant visitors are crossing their fingers that 1 Hotels will actually be able to open the doors next month as promised. The Central Park location will be the first in a series of luxury eco-hotels from the brand, with locations near Brooklyn Bridge Park and in South Beach expected to open some time next year. 1 Hotels will open their flagship hotel near Central Park this month.